Lights Out is an extremely popular American old-time radio program, an early example of a network series devoted mostly to horror and the supernatural, predating Suspense and Inner Sanctum. Versions of Lights Out aired on different networks, at various times, from January 1934 to the summer of 1947. In the fall of 1933, NBC writer Wyllis Cooper conceived the idea of “a midnight mystery serial to catch the attention of the listeners at the witching hour.” The idea was to offer listeners a dramatic program late at night, at a time when the competition was mostly airing music. At some point, the serial concept was dropped in favor of an anthology format emphasizing crime thrillers and the supernatural. The first series of shows (each 15 minutes long) ran on a local NBC station, WENR, at midnight Wednesdays, starting in January 1934. By April, the series proved successful enough to expand to a half hour. In January 1935, the show was discontinued in order to ease Cooper’s workload (he was then writing scripts for the network’s prestigious Immortal Dramas program), but was brought back by huge popular demand a few weeks later. After a successful tryout in New York City, the series was picked up by NBC in April 1935 and broadcast nationally, usually late at night and always on Wednesdays. Cooper stayed on the program until June 1936, when another Chicago writer, Arch Oboler, took over. By the time Cooper left, the series had inspired about 600 fan clubs. Cooper’s run was characterized by grisly stories spiked with dark, tongue-in-cheek humor, a sort of radio Grand Guignol. A character might be buried or eaten or skinned alive, vaporized in a ladle of white-hot steel, absorbed by a giant slurping amoeba, have his arm torn off by a robot, or forced to endure torture, beating or decapitation—always with the appropriate blood-curdling acting and sound effects. Though there had been efforts at horror on radio previously (notably The Witch’s Tale), there does not seem to have been anything quite as explicit or outrageous as this on a regular basis. When the series switched to the national network, a decision was made to tone down the gore and emphasize tamer fantasy and ghost stories. Only one recording survives from Cooper’s 1934-1936 run, but his less gruesome scripts were occasionally rebroadcast. An interesting example is his “Three Men,” which became the series’ annual Christmas show (a 1937 version circulates among collectors under titles like “Uninhabited” or “Christmas Story”); it has a plot typical of Cooper’s gentler fantasies. On the first Christmas after World War I, three Allied officers meet by chance in a train compartment and find one another vaguely familiar. They fall asleep and share a dream in which they are the Three Wise Men searching for Jesus. But is it really a dream? In the best tradition of supernatural twist endings, Cooper has the officers wake to find a strange odor in their compartment—which turns out to be myrrh and frankincense. In the mid-1940s, Cooper’s decade-old scripts were used for three brief summertime revivals of Lights Out. The surviving recordings reveal that Cooper was experimenting with both stream of consciousness and first-person narration a few years before these techniques were popularized in American radio drama by, among others, Arch Oboler and Orson Welles. In one tale, a murderer describes how the Chicago police try to beat a confession out of him. When that doesn’t work, they put him in a jail cell haunted by the ghost of a previous occupant, a smooth gangster named Skeeter Dempsey who describes his own execution and discusses the afterlife knowledgeably. In the final twist, the narrator reveals that he has taken Skeeter’s advice to commit suicide and is now himself a ghost. Another story, originally broadcast in March 1935 as “After Five O’Clock” and revived in 1945 as “Man in the Middle,” allows us to follow the thoughts of a businessman as he spends a day at the office cheating on his wife with his secretary. The amusing contrast between what the protagonist thinks to himself and what he says out loud to the other characters enlivens one of Cooper’s favorite plot devices, the love triangle. Other Cooper scripts are more routine, perhaps in part because the author’s attention was divided by other projects. From the summer of 1933 until August 1935, Cooper was NBC Chicago’s continuity chief, supervising a staff of writers and editing their scripts. He resigned in order to devote more time to Lights Out as well as a daily aviation adventure serial, Flying Time. At various times, he also served on NBC’s Program Planning Board, wrote the soap opera Betty and Bob, and commuted weekly to produce another program in Des Moines, Iowa. A novelist, struggling to write a locked room mystery, locks himself in his office only to be interrupted by a stranger who resembles the story’s murderer. A killer named “Nails” Malone has “a conference with his conscience” about the murders he’s committed. A scientist accidentally creates a giant amoeba that grows rapidly, eats living things (like the lab assistant’s cat), and exhibits powers of mind control. The show benefited tremendously from Chicago’s considerable pool of creative talent. The city was, like New York, one of the main centers of radio production in 1930s America. Among the actors who participated regularly during the Cooper era were Sidney Ellstrom, Art Jacobson, Don Briggs, Bernardine Flynn, Betty Lou Gerson, and Betty Winkler. The sound effects technicians frequently had to perform numerous experiments to achieve the desired noises. Cooper once had them build a gallows and wasn’t satisfied until one of the sound men personally dropped through the trap. The series had little music scoring save for the thirteen chime notes that opened the program (after a deep voice intoned, “Lights out, everybody!”) and an ominous gong which was used to punctuate a scene and provide the transition to another. When Cooper departed the show in 1936, his replacement—a young, eccentric and ambitious Arch Oboler—picked up where he left off, often following Cooper’s general example but investing the scripts with his own concerns. Oboler made imaginative use of stream-of-consciousness narration and sometimes introduced social and political themes that reflected his commitment to antifascist liberalism. Although in later years Lights Out would be closely associated with Oboler, he was always quick to credit Cooper as the series’ creator and spoke highly of the older author, calling him “the unsung pioneer of radio dramatic techniques” and the first person Oboler knew of who understood that radio drama could be an art form. In June 1936, Oboler’s first script for Lights Out was “Burial Service,” about a paralyzed girl who is buried alive. NBC was flooded with outraged letters in response. His next story, one of his most popular efforts, was the frequently repeated “Catwife,” about the desperate husband of a woman who turns into a giant feline. He followed with “The Dictator,” about Roman emperor Caligula. This set the pattern for Oboler’s run: For every two horror episodes, he said later, he would try to write one drama on subjects that were ostensibly more serious, usually moral, social, and political issues. Oboler met the demand by adopting an unusual scripting procedure: He would lie in bed at night, smoke cigarettes, and improvise into a Dictaphone, acting out every line of the play. In this way, he was able to complete a script quickly, sometimes in as little as 30 minutes, though he might take as long as three or four hours. In the morning, a stenographer would type up the recording for Oboler’s revisions. Years later, Rod Serling, who counted radio fantasists like Cooper, Oboler, and Norman Corwin among his inspirations, would use a similar process to churn out his many teleplays for The Twilight Zone, a series that in many respects was to television what Lights Out was to radio. Despite acclaim for Oboler’s dramas, NBC announced it was canceling the series in the summer of 1937—”just to see whether listeners are still faithful to it,” according to one press report but also, it seems, to allow the hard-working author a vacation. Another outcry from fans led to the program’s return that September for another season. Oboler left in the summer of 1938 to pursue other projects, writing and directing several critically acclaimed dramatic anthology series: Arch Oboler’s Plays, Everyman’s Theatre, and Plays for Americans. A variety of NBC staff writers and freelancers filled in until Lights Out was canceled in 1939. NBC Chicago continuity editor Ken Robinson supervised some of the writing. Regular contributors included William Fifield and Hobart Donovan. A recording of the fifth anniversary show survives from this season. Donovan’s “The Devil’s Due,” about criminals haunted by a mysterious stranger, is in keeping with the formula laid down by Cooper. In 1942, Oboler, needing money, revived the series for a year on CBS. Airing in prime time instead of late at night, the program was sponsored by the makers of Ironized Yeast. Most of the Lights Out recordings that exist today come from this version of the show. For this revival, each episode began with an ominously tolling bell over which Oboler read the cryptic tagline: “It…is…later…than…you…think.” This was followed by a dour “warning” to listeners to turn off their radios if they felt their constitutions were too delicate to handle the frightening tale that was about to unfold. “The Ugliest Man in the World,” a sentimental tale of a hideously deformed man seeking love in a cruel world, inspired by Boris Karloff’s typecasting in horror roles . “Bathysphere,” a political thriller about a scientist and a dictator sharing a deep sea diving bell. “Visitor from Hades,” about a bickering married couple trapped in their apartment by a doppelgänger. Another unusual script, “Execution,” about a mysterious French woman who bedevils the Nazis trying to hang her, had previously aired on Oboler’s wartime propaganda series Plays for Americans. Like Cooper, Oboler made effective use of atmospheric sound effects, perhaps most memorably in his legendary “Chicken Heart,” a script that debuted in 1937 and was rebroadcast in 1938 and 1942. It features the simple but effective “thump-thump” of an ever-growing, ever-beating chicken heart which, thanks to a scientific experiment gone wrong, threatens to engulf the entire world. Although the story bears similarities to an earlier Cooper episode (about an ever-growing amoeba that makes an ominous “slurp! slurp!” sound), Oboler’s unique choice of monster was inspired by a Chicago Tribune article announcing that scientists had succeeded in keeping a chicken heart alive for a considerable period of time after its having been removed from the chicken. Recordings of the original radio broadcasts are lost or unavailable, although Oboler later recreated this episode for a record album in 1962. Part of the episode’s notoriety stems from a popular standup routine by comedian Bill Cosby (on his 1966 album Wonderfulness), an account of his staying up late as a child to listen to scary radio shows against his parents’ wishes and being terrified by the chicken heart. Bill also referenced the episode in a ‘camping’ episode of Fat Albert and the Cosby Kids. “Come to the Bank,” in which a man learns to walk through walls but gets stuck when he tries to rob a vault. “Oxychloride X,” about a chemist who invents a substance that can eat through anything. “Murder Castle,” based on the real-life case of H. H. Holmes, Chicago’s notorious serial killer. “Profits Unlimited,” a still-relevant allegory on the promises and dangers of capitalism. “Spider,” in which two men attempt to capture a giant arachnid. “The Flame,” a weird exercise in supernatural pyromania. “Sub-Basement,” which finds yet another husband and wife in peril—this time trapped far beneath a department store in the subterranenan railway of the Chicago Tunnel Company. Lights Out often featured metafictional humor. Perhaps inspired by Cooper’s “The Coffin in Studio B,” in which actors rehearsing an episode of Lights Out are interrupted by a mysterious coffin salesman peddling his wares, Oboler wrote stories like “Murder in the Script Department,” in which two Lights Out script typists become trapped in their building after hours as frightening, unexplained events occur. In “The Author and the Thing,” Oboler even plays himself pitted against one of his own monstrous creations. After the 1942-43 Lights Out, Oboler continued to work in radio (Everything for the Boys and revivals of Arch Oboler’s Plays) and pursued a second career in filmmaking, first in the Hollywood mainstream and then as an independent producer, writing and directing a number of offbeat, low-budget films, including Five, about survivors of a nuclear war, The Twonky, a satire of television, and the 3-D film Bwana Devil, which made a huge profit on a small investment. He dabbled in live television (a six-episode 1949 anthology series, Arch Oboler Comedy Theater), playwriting (Night of the Auk), and fiction (House on Fire). In 1962, he produced an album entitled Drop Dead! which recreated abbreviated versions of his Lights Out thrillers, including “Chicken Heart” and “The Dark,” about a mysterious creeping mist that turns people inside-out. 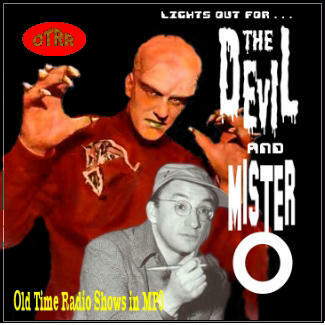 In 1971-1972, Oboler produced a syndicated radio series, The Devil and Mr. O (he liked for people to call him “Mr. O”), which featured vintage recordings from Lights Out and his other series with newly recorded introductions by Mr. O himself.